This is the electronic toolbox that could be the missing link for cine lens and camera metadata. So far, we have several standards for cine lens data. These include iterations of ARRI LDS, Cooke /i, ZEISS XD and the still photo protocols from Canon, Sony, Leica, Nikon, Panasonic, etc. Why do you need lens metadata? If you’re the second AC, recorded metadata means you no longer have to keep a handwritten log of every shot’s focal length, focus distance, aperture and serial number. Same goes for the script supervisor: no more shouting across the soundstage for lens information. If you’re the DP, you can instantly see all the lens settings on a monitor. Best of all, the focus puller also gets real-time data on a monitor with focus distance, T-stop, instant depth of field calculations, and more. Camera metadata is increasingly important. In this new world of free-form formats, windowed pictures and aspect ratio independence, it’s essential to know the active image area. Editors, Colorists and VFX teams benefit from knowing active image area, frame rate and shutter angle for every frame. The latest versions of metadata can also identify camera position, tilt, height, direction and velocity. But—a big question pops up. How do we record all these different data streams, coming from diverse protocols from various manufacturers, few of whom seem to have agreed upon a common standard? Camera and lens metadata is one of those esoteric electronic topics that seems to be pushed aside by manufacturers and users alike—sort of like a college students dread of cleaning up the dorm room. Camera and lens manufacturers only have a certain amount of resources and a determined number of engineers. Most of them are usually swamped with keeping the cameras running and the lenses assembled. Probably the last thing most of them want to deal with is metadata. 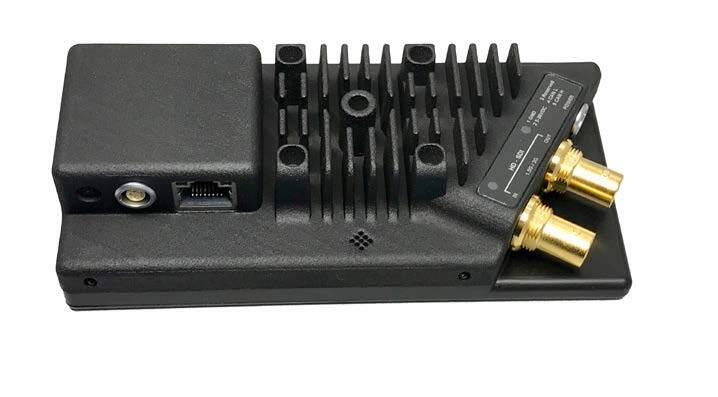 A Missing Link is found in Transvideo’s StarliteHD-m. The StarliteHD-m is an advanced electronic toolbox. It’s a compact monitor/recorder that attaches nicely to almost any camera. It has an intuitive touchscreen video display and control. It is small and lightweight. If you’re shooting a multiple camera setup, put one StarliteHD-m on each camera. For focus pullers: lens information, depth of field, focus magnification, focus peaking, camera status and data. For script supervisors: record/playback, data, PDF report. For camera operators: virtual horizon, data, shot playback. Metadata from the camera’s SDI output. Camera information via a direct Ethernet connection. Lens metadata from the serial connector of the lens or mount. Basic lens data (T-stop, focus, zoom position) is often available though the camera mount and transferred to the camera’s HD-SDI output. The latest lenses also give us access to critical information via direct serial connection about shading, distortion mapping, illumination, etc. This advanced data, so helpful for post production and VFX, must be collected directly from the lens. 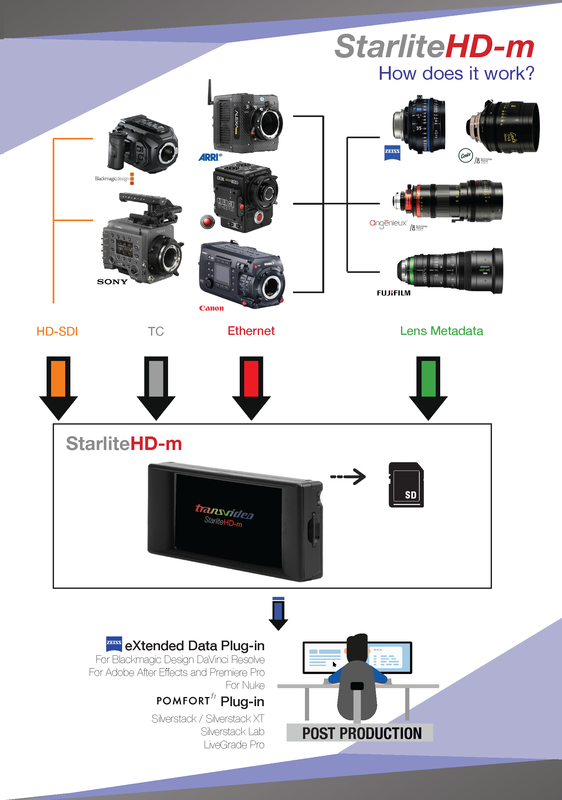 The StarliteHD-m is the missing link that aggregates all this data. Files are recorded onto an SD card in the unit. These metadata files can then be added automatically to the video files. They are synced together with timecode. Basic lens data provided by Cooke /i, ARRI LDS, ZEISS eXtended Data, and more to follow. Camera information via RDD18 (Sony protocol) or ARRI protocol. More to come. Cooke /i (all iterations), ZEISS eXtended metadata, etc. Additional camera info gathered in to the metadata file. Gathers precise Time Code (LTC type) from the camera.